How do we stop America’s voter-assisted suicide? It’s Election Day in America, and all the familiar gears, wheels, and tools of propaganda are in full motion. The (mostly) controlled game is on and the (mostly) contrived drama is thick. But will ObamaCare actually be repealed if the Republicans gain control of both houses of Congress…again? Nope. And we all know it. Because of the way that today’s “conservative Republicans” and their “conservative” fans regard gigantic Marxist programs like State-controlled children’s “education”, Social Security, and Medicare. As we touched on yesterday in How do we bring politics back from the dead?, both major political parties are marching us steadily toward the same Statist destination. Go along to get along, so that we can have it as good as possible for the short time left before the cage door of a secured super State seals behind us, our children, and our children’s children? Do we just surrender to the “inevitability” of decline and darkness here in America? Well, if you’re the typical American professing Christian whose been drenched in the most popular “end times” views and such, the answer is probably pretty close to, “yeah, basically”. But if you’re a biblically informed Christian who, by the grace of God, takes the supernatural Gospel and Great Commission of Christ the King seriously, then you will see the great opportunity that is staring straight at us through the thick fog of distracting lies, spin, and political propaganda. For all of the darkness, decline, and depressing culture-spanning wickedness that has come to us through our rank pride and futile, self-destructive rebellion against the lordship of Christ, there is now incredible opportunity for His faithful remnant to actively proclaim and apply the Gospel and Great Commission right here and right now in this political season. Every time we are asked for our opinion on any issue or candidate, we are being blessed with the opportunity to not only say who or what we are for or against, but why. And that, dear Christian Brothers and Sisters, is a cracked door that we should bound through each and every time that it is offered to us. With each description of each position on each issue or politician under consideration, we will have roughly a thousand opportunities to tie our rational and reason to the Nature of Jesus as defined in His Word. We will have a thousand different routes by which we might boldly and clearly proclaim the supernatural Gospel of Christ the King – the only message graced by God with the miraculous power to transform people from sin-loving rebels into righteousness-loving New Creatures in Christ. That, Dear Brothers and Sisters, is how we can begin to stem the tide on the slow, presently unfolding voter-assisted suicide of the American culture. That is how, by God’s grace through His Gospel and Great Commission, people can and will actually be saved. And those New Creatures in Christ, having been truly and fundamentally transformed, cannot help but impact their families, communities, and cultures in a like manner. That is how even this culture can be saved…one supernatural conversion at a time through the Gospel of Christ, all by His grace and for His glory. How do we get people to “wake up” and stop actively supporting the long march to Statism being orchestrated by the Republican and Democrat Parties? How do we get people to “wake up” to the importance of honoring and preserving the God-ordained, God-defined institutions of marriage and family? How do we get people to “wake up” and embrace the Scripture defined definitions, responsibilities, and limitations of the family, church, and state? Every person is born dead to these truths. Every person is born hating them. Only the Gospel can change that, so it is quite literally true that our only real hope for true, lasting, positive political change in America is through the whole, undiluted Gospel of Jesus Christ. Oh yeah, we’ll be told and encouraged by some (including most professing Christians in the land) to keep such things as the Gospel sequestered away or at least watered down and vague so that we can have “more productive” conversations with folks who might be “offended” by the loving command to repent, believe, and be saved. And yes, we’ll each feel inside that this whole one-at-a-time-conversion-by-the-Gospel approach just doesn’t act quickly enough, and “America needs practical solutions right now!”…but if we will simply rest and trust in Him, “be still and know that He is God”, and obediently take up His Great Commission as the only true solution that we or any other people have ever had, things will go much better than any secular conservative or liberal “expert” can even begin to imagine, much less believe. 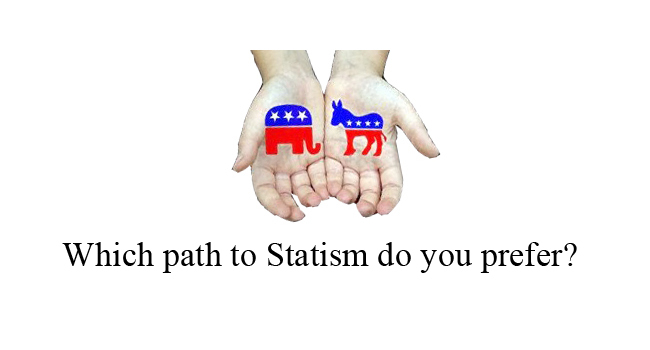 Yes, the path to Statism is even now in this election cycle being charted by the leadership of both the Republican and Democrat Parties. Yes, at our present pace, our children and grandchildren will grow and live under the anti-Christian boot of an Orwellian American Superstate. Yes, America is on death’s door and needs supernatural intervention right now. And most thankfully, by the grace of God, that is exactly what He is extending to her now…through His people’s faithful proclamation of His Gospel and application of His Great Commission in every realm of life. How Americans respond with their “vote” – whether they choose life or death for their culture and the children born into it – is not our responsibility. Obediently proclaiming the Gospel so that they might have the opportunity to choose life through Christ is our responsibility…and our incredible honor, all by the grace and for the glory of our King.